Microscope slides made of soda-lime glass comply with DIN ISO 8037-1 and 8037-2, bear the CE mark and are produced in compliance with Directive 98/79/EC (IVD). This means they are the ideal solution for excellent and reproducible microscopy results. The microscope slides, measuring approx. 76 x 26 mm, have a thickness of around 1 mm and are delivered pre-cleaned and ready for use. The 20 mm wide, coloured or colourless frosted area is at one end on one side. 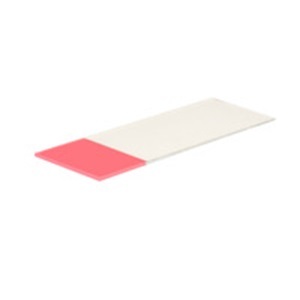 Cut microscope slides are particularly economical and therefore represent an excellent alternative to the ground versions, for routine tasks. The corners and edges are 90° for all cut microscope slides.